Anne Hathaway's Cottage is a thatched farmhouse with stunning grounds and gardens, which overflow with beautiful blooms, and traditional shrubs. The cottage is in Shottery, a hamlet within the parish of Stratford-upon-Avon. It is just over one mile from the town centre but can be accessed via a pleasant, well sign-posted footpath. See for yourself the many original items of family furniture, including the Hathaway Bed, dating from Anne's time and take in the beauty and tranquillity of the charming cottage gardens. For info please see Shakespeare Birthplace Trust. BIRTHPLACE PASS: Includes entry to Shakespeare's Birthplace, Nash's House & New Place, Hall's Croft and Shakespeare grave at Holy Trinity Church. This can be easily reached on foot across Shottery fields and is well signposted from Stratford-upon-Avon town centre. The walk takes approximately half an hour and takes the walker through the pretty village of Shottery. By car from the Tourist Information Centre take the main road through the centre of town and follow signs for Evesham or Worcester (Alcester). 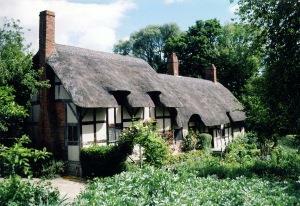 Anne Hathaway's Cottage is well signed and is situated approximately one mile from the centre of Stratford.